Nestled in the whimsical Smoky Mountain woods, Sunflower House is the perfect couple’s escape or writer’s or hiker’s retreat. This studio-style cabin for 2 features a wood-burning fireplace, flatscreen TV, full bathroom, and a king-size log bed. Rekindle romance and enjoy peaceful nights less than 7 miles from downtown Pigeon Forge in the Hidden Mountain Resort. Charming and cozy, the classic log interior combines with the lovely sunflower décor to create a beautiful, blossom-filled home. Outside, prepare a steak dinner on the charcoal grill, and when evening sets, soak in the hot tub on the screened-in porch. Then, head inside to watch a romantic comedy while unwinding in the jetted tub. In the morning, sip hot coffee in the rocking chairs before enjoying a gentle sway with your sweetheart on the porch swing. Next, explore downtown attractions and shops, then return to your quaint mountain abode for even more wonderful memories with your special someone. 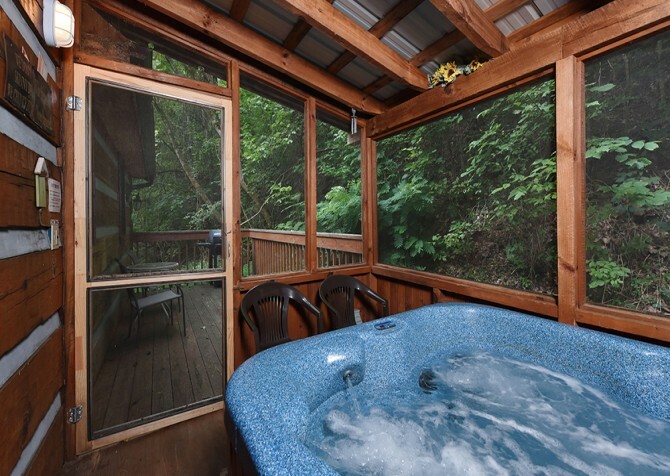 Whether you’re on your unforgettable honeymoon, an anniversary trip, or a “just because” weekend getaway, Sunflower House has everything you need for a romantic, relaxing, and fun Smoky Mountain stay. Step into the cozy living area, furnished with a royal-blue leather sofa and matching recliner, a flatscreen TV with DVD player, and a wood-burning fireplace. The two-toned hardwood floors flow throughout the space, complementing the exposed wood beam above. The ceiling fan keeps the room cool on summer days while winter months can be enjoyed with a mug of cocoa by a flame-crackling fire. It’s the perfect place to curl up with the one you love or defeat writer’s block with a quiet night in the Smoky Mountains. For a bit of entertainment, lay out refreshments on the coffee table, pop in a movie, cuddle under the couch throw, and press play. Just around the corner rests the fully equipped kitchen, complete with major and minor appliances, pots and pans, cooking utensils, dishware, mugs, and more. There’s also a small window over the stainless-steel double sink, bringing the woodsy views indoors. Store fresh ingredients, whip up homemade meals, and keep midnight snacks close at hand. Surprise your loved one with breakfast in bed, reheat restaurant leftovers for lunch, and enjoy a professionally prepared dinner for 2 at the cabin. Beside the kitchen is the dining area with a quaint table and 2 cushioned chairs — great for peaceful breakfasts and candlelit dinners. This space is also useful for checking emails, planning in-town activities, and keeping up with the Cabins for YOU blog over the free Wi-Fi. Offering the best of a studio-style space, the king-size log bed faces the living room’s flatscreen TV, so you can enjoy classic films from bed. It’s also within perfect view of the indoor jetted tub nearby. Although, we do recommend switching off the TV, playing relaxing tunes, lighting a few scented candles, pouring in a rejuvenating bath salt, and unwinding in the steamy water. You can even pre-order the Princess Bath and Bouquet gift basket that will be ready and waiting at the cabin for YOU! Prefer to take a quick shower before painting the town red? No worries; there’s a convenient oversized and tiled walk-in shower in the full bathroom. As you walk up to the semi-private Sunflower House, you’ll be greeted by woodsy views, a charming sunflower motif, a beautiful log exterior, an inviting porch swing, pastel-yellow rocking chairs, and a custom-made sunflower bench. Out back, there’s an open deck with a charcoal grill and outdoor seating plus a screened-in section with a bubbly hot tub. There’s even a small yard where you can stretch your legs and a small creek that adds to the tranquility at Sunflower House. And when you’re ready to check out the nightlife downtown, the flat, paved, motorcycle-friendly driveway with parking for 2 vehicles makes it easy. Other amenities at Sunflower House include a washer and dryer to keep the laundry pile down when you return home, a VCR to enjoy classic home videos, and complimentary high-speed wireless internet so you can post photos and videos of your trip with ease. Located under 7 miles from downtown Pigeon Forge, Sunflower House is convenient to the many popular attractions, wineries, shops, and restaurants in the area. You can browse for yourself or pick up some great local goods as gifts and souvenirs to take back home. If you want a romantic day in town, take a tour at a local winery, go to a dinner show, or stroll around at The Island before taking a ride on the Great Smoky Mountain Wheel. If you prefer to get your adrenaline pumping, try a zip line, arcade games and laser tag, go karts, indoor skydiving, whitewater rafting, or biking in the nearby Great Smoky Mountains National Park! Goats play on the roof (literally) while you ride down the mountain, zoom through the trees, and a whiz around sharp turns aboard The Coaster at Goats on the Roof…rightly dubbed. An ancient Egyptian tomb stands between you and an angry pharaoh, and you only have 45 minutes to escape at The Tomb Escape Game! Interested in a live-action role playing game with magical wands? MagiQuest is where you’ll want to be, featuring mysteries you must solve with your wizarding skills.